Do I Need to Take a Motorcycle Safety Course? Riding a motorcycle is a ton of fun – but it’s also a dangerous business. While cars cause more fatalities than motorcycles do, several thousand people die every year from motorcycle accidents. Motorcycles take skill to operate, and it’s important that you know how to drive safely before you ever hit the road. What Motorcycle Safety Course Should I Take? Some states will require a motorcycle safety course for specific age groups before you can be licensed, like in California which requires all riders under the age of 21 to take a safety course. Many states will offer to waive a portion of the testing if you complete a course. But whether or not your state mandates a motorcycle safety course, it is a good idea to take one. You will feel more confident in your driving abilities and keep you, your passengers, and everyone on the road safer. The gold-standard for motorcycle safety courses is the Motorcycle Safety Foundation (MSF). They provide a variety of classes for beginners and advanced riders alike in every state as well as online. Many states also have a partnership between the state DMV and the MSF – that’s how good they are. If you are looking for the highest quality, they are the best bet. What Will I Learn In A Motorcycle Safety Course? 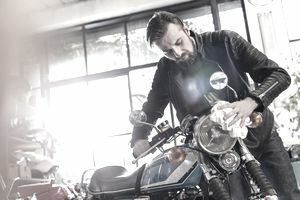 A good motorcycle safety course will teach you everything you need to know to safely get started riding a motorcycle, including familiarizing yourself with your bike, how to maneuver your bike, how to handle tight curves, and how to brake safely. You will get a combination of classroom and on-the-road instruction, so you will have plenty of time to practice and discuss your skills. How Much Does A Motorcycle Safety Course Cost? Generally, a basic safety course will run you around $200-400, depending on your area. How Old Do I Need To Be To Take A Motorcycle Safety Course? It varies, but it depends on how old you need to be to get a motorcycle license in your state. You will need to have a motorcycle permit in order to enroll in most courses. If you are under the license-eligible age, you still might be able to take the course with the permission of a parent or guardian and the instruction site – you just will not be able to get your license until you are of eligible age. Do I Need To Know How To Ride A Motorcycle? You should definitely know how to balance on a motorcycle before you attend a beginner course to get the maximum value out of the instruction time. If you cannot do this, ask the testing site you want to take a course with if you can schedule some time in advance to learn how to balance on a bike. What Should I Wear To A Motorcycle Safety Course? If you have a motorcycle helmet, you should bring it to the course, but they will generally have motorcycle helmets available for you to borrow. You will definitely need to cover your exposed skin, which means long sleeves, gloves, pants, and shoes that cover your ankles. How Much Of A Time Commitment Is A Motorcycle Safety Course? It depends on what course you sign up for. A bare-bones beginner course will typically consist of about 15 hours of hands-on training split over the course of a few sessions. The instruction will typically consist of 5 or so hours of classroom instruction and 10 hours of actual driving practice. More advanced or specialized courses may vary. What Other Benefits Will I Get From A Motorcycle Safety Course? The most immediate perk of a motorcycle safety course is that you will be a safer driver, and might even get to skip the written portion of the motorcycle licensing exam, depending on your state. In addition to mastering new skills, you will likely be eligible for discounts from your insurance company. Being a safer driver saves your insurance company the additional risk of insuring an unsafe driver, and more often than not, they will be willing to pass some of those cost savings on to you. Definitely ask your insurance agent about what course you would need in order to qualify for a discount. Some motorcycle manufacturers will also sponsor or subsidize the cost of a motorcycle safety course for individuals who buy their motorcycles. Nothing is worse for a brand than deadly crashes involving their bikes, so it pays for them to have the safest drivers, too. Do I Need To Know How To Ride? How Much Of A Time Commitment Is It? What Other Benefits Will I Get? Do You Really Need to Buy Tire Insurance?